Coping with depression in teens is one of one of the hardest, most heartbreaking parenting challenges. It’s easy to feel like you’re alone in your battle. You’re not. Many of us have been there before, whether with our own teens or as teens ourselves. By sharing our stories with each other, we can create a community to lean on. I’m sharing my story of coping with depression in teens, and I invite you to do the same in the comments. Even if you don’t feel comfortable doing so, I hope you’ll know that you’re not alone. Related: How Much Should We Spy on Our Teens? Do you have a story about coping with depression in teens? If you’re comfortable, share in the comments so we can all learn from each other. “I just want to leave home” he sobs, “I just want to get out of here.” I stare at my teenager on the couch opposite me as he chokes out the words. It’s taken a morning walk out with an epic door slam, a day of radio silence over phone and text and 45 minutes of screaming and yelling to get to this relatively calm point. He’s said things he can’t take back now. Hurtful things that can target you right in the most vulnerable bits in a way only a teenager can. I’ve become a little immune for my own protection. “Our family is broken,” he says. Ouch, that one hits home, and I think he can tell as I visibly flinch. He’s still talking, but I am lost in his last sentence. ‘Our family is broken.’ Is it? Are we? I don’t think we are but in his teenage mind, he sees us as such. 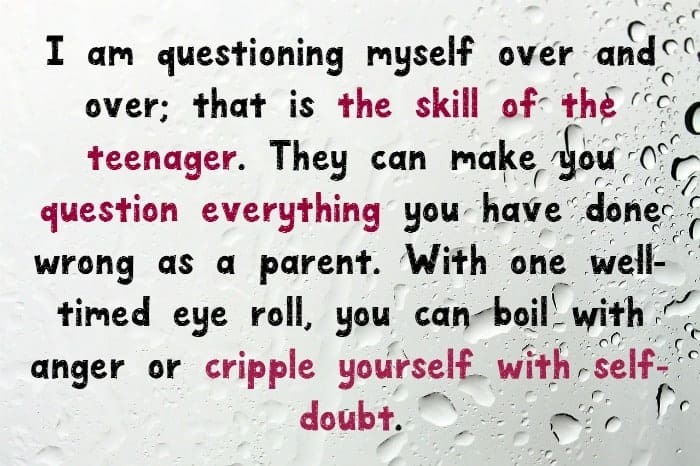 I am questioning myself over and over; that is the skill of the teenager. They can make you question everything you have done wrong as a parent. With one well-timed eye roll, you can boil with anger or cripple yourself with self-doubt. That’s my crime. I’ve tried too hard to help. I stare at him sat there, He’s not trying to hurt me on purpose, but his teenage angst is driving him forward to say bigger and nastier things, to test his boundary line as he pulls towards adulthood and independence. I’ll be honest; I’m thrown. I don’t have a response. I am hurting and as the adult, I have to try and pretend I’m not. I’ve tried too hard. I’ve gone too far. I question myself, would he hate me if I had tried a little less? Then it hits me. Yes, he would. It doesn’t matter what I do or don’t do. I’m his mother, I am the focus for all his rage, I am his learning curve. He will see everything I do wrong and he will grow up and try to do it differently. I am the catalysis for his parenting. But more than that, I am his safety. When he was tiny, he would fall or trip over, and he would run to me. Nothing fixed the pain or the bump until I had cradled his tiny fingers in mine, held them up and kissed them better. No band aid could heal anything as well as a kiss from mummy. Now he’s a seething ball of hormone and pain and misunderstanding, and he’s running to me again but in a different way. He’s throwing words at me as hard as he can, and all I can do is sit here, listen to them and metaphorically kiss him better until the pain goes away. No matter how much I want to yell back. So I do, I sit, and I let him talk, I hide the wincing when a particular barb hits harder than he anticipated. I let him talk it out until he is spent then we start to build things back up from the ground. We smile weakly at one another, we laugh a little; we fix him a snack and he is better, for now. When he finally falls asleep, I will take the broken pieces of my heart and slowly start to stick them back together ready for the next time and he will never know. Until he’s sat opposite his own teens, until he’s raised them himself, fixing all the things he thought I did wrong. Until his own child looks him in the eye and says words that can never be taken back. He will never understand or know how many times a parent’s heart can break and how even then he can come to me, and I will try to fix it for him. I will always try too hard and I hope in time he will love me for it. Did You Know these Five Facts about Bullying in History? 5 Delicious Ways to Enjoy Bays English Muffins + Holiday Sweepstakes! Donnalynn is a mother of 3 boys which naturally lead to her love of wine. She moved to Canada from the UK 4yrs ago, discovered poutine and being able to sit at her desk writing and her hips haven't been seen since. She's a great singer and is positive her children only hide the microphone from the karaoke machine to help out with some exercise as she hunts around the house for it. This is such a sad topic but it’s great to see it talked about. In these situations it’s so hard for both sides. The teen years are a tough time and it’s very important to keep those communication channels open. I don’t have the answer but staying on top of it and seeking professional help is important. When I was 16 I went through a period of depression after my father passed away suddenly from a car accident. I was blessed to have a great support system and I was able to deal with it. Sadly that is not the case for many teens. Ughhh unfortunately I’ve know a lot of people with depression. Definitely something to take seriously. People don’t always think clearly when that upset. Depression is hard to cope with even as an adult!! These are great tips for helping a teenager with depression! I went through depression from ages 9 to 14, it was really tough but I pulled through. My sis who’s 17 is also battling it, but she’s seeing a professional. 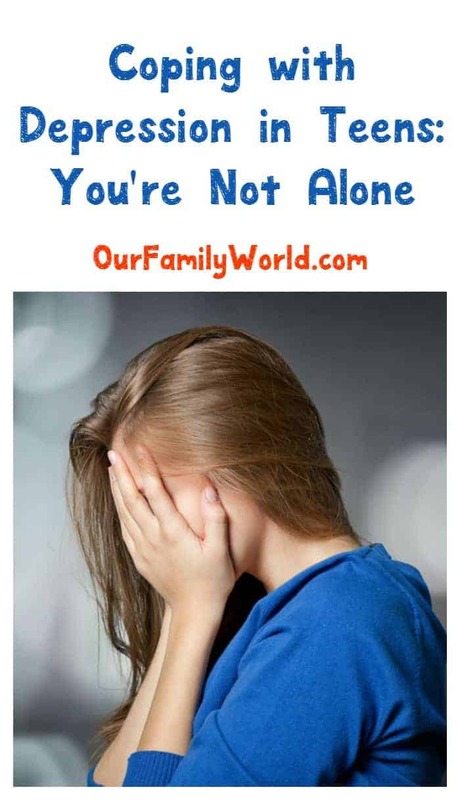 Teenagers are already going through a tumultuous time and need the support of their family and friends more than ever. It’s so important to be aware of the signs of teen depression. I have never dealt with depression in a child. I have seen adults deal with it but I am sure it’s a bit more confusing for a child. Does Pesticide Exposure During Pregnancy Cause Autism?